Today, I watched a horrific video of elephant trainers from Ringling Brothers beating their elephants. After you watch it, I hope you will be as moved as I was to write a short letter to the company holding them accountable for these inexcusable actions. I was disgusted and horrified to see this video of your trainers beating elephants with bullhooks. This is despicable and cruel behavior. My mom used to take me to the circus every year as a child and I loved it, but knowing that you are treating your animals like this makes me think I should never patronize your shows again! You should be ashamed. I think the entire world deserves an explanation for this behavior, and there should be a major change in your policies regarding how you treat animals. I would like a WRITTEN RESPONSE. Big news: Attorney General Holder may be on the verge of appointing a special prosecutor to investigate cases of torture from the Bush era. With new revelations coming to light regularly, it's critical that an impartial investigator has the power to find out exactly what happened and who was responsible. And that investigation must hold the architects of the program accountable. It's the only way we'll be able to make sure it never happens again. But there's enormous political pressure to bury the worst abuses. The Attorney General is sending signals that he may move forward despite the pressure—and he needs to hear from regular Americans who are standing with him and want the truth. Can you email Holder right now to ask him to appoint a special prosecutor who can hold the architects of the program accountable? Below is a copy of the letter I sent to the AJ. Feel free to crib from it for your own letter. As many Republican Senators reminded us today in the confirmation hearings for Judge Sotomayor, we are a nation of laws that must uphold the rule of law. The pursuit of equal justice under our law demands that those who break it be held responsible for their crimes. There is much we still do not know about the torture program authorized by the Bush Administration. The little we do know suggests that a deeper investigation is warranted - and it is to you, and our Department of Justice, that we look to hold the architects of the program accountable. There MUST be consequences for breaking law, and it is within your power to assure that justice be done. I hope and pray that you will do the right thing by authorizing an independent investigation of the Bush-era torture program. The appointment of a special prosecutore who will be able to investigate the entire program, inclduing those who designed it, will be an important step in restoring the rule of law in our democracy. America took one step closer to declaring its Independence from Mediocrity this July 4th with the Sarah Palin's abrupt announcement that she will be resigning from the office of Governor of Alaska at the end of the month. In a rushed and rambling speech from her Wasilla home, Palin resigned from office with 17 months to go in her first term. 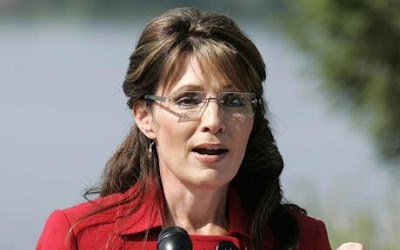 Critics on the left smell blood in the water, calling Palin "the bull goose loony of the GOP" and "Caribou Barbie." Yet it wasn't just Democrats scratching their heads at Palin's bizarre move; even Republicans like Karl Rove were admitting that her actions hurt her chances for a 2012 presidential bid. One prominent conservative blogger declared her "done with elected politics." The Wall Street Journal put it plainly enough when they wrote "Giving up on an executive job a year and a half early isn't the best way to persuade voters you're ready for the more demanding rigors and scrutiny of the White House." Now comes the speculation about why. Palin certainly seemed like a woman running from something, and the chattering class is already in a frenzy over what that something could be. I'll leave others to speculate on the true reason for Palin's resignation, and I suspect more information about this will reveal itself in the coming weeks. Personally, while others might celebrate the quick drop in Palin's presidential stock, I for one am saddened by the loss of this contender, if only because her nomination would have all but assured certain victory for President Obama in 2012. This intellectual lightweight is just the kind of political mosquito that Obama would crush in a presidential matchup. So, while others revel in the loss of Sarah Palin, I'm going to take a more mournful approach. So long, Sarah. I'm sorry to see you go.